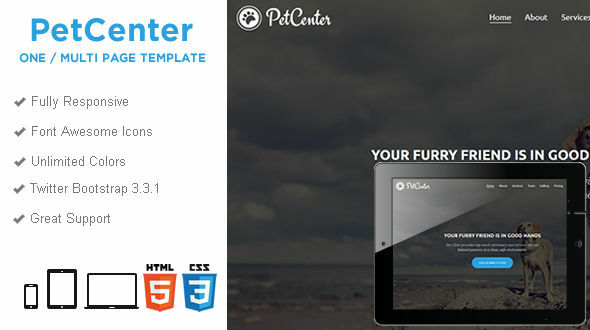 Pet Clinic is a fully responsive one / multi page HTML5 template built with Twitter Bootstrap 3.3.1 framework. The template is perfect for vets, animal clinics, animal shelter, dog training websites, but you can change it for other purposes too. The template is well organized so you can easily modify it. In case you get stuck with editing, drop us an email and we’ll do our best to help you. If you have pre-sale questions or need support / custom work don’t hesitate to contact us via private message. NOTE: Images used in the online demo belong to their respective owners and are not included in the purchased package.